Confusingly prefixed with an S until the ED’s release, the XR series began its successful career as the XR8 sedan, which heralded the return of Windsor V8 power after a nine-year absence. With its 165kW/388Nm 5.0L V8, sports-tune suspension and upgraded brakes, the S-XR8 recalled Ford’s original 1967 XR GT’s pursuit of affordable sports sedan performance. Standard features: Air-con, alloy wheels, power steering, sports seats, front and rear spoilers, limited slip differential (LSD), sports instrumentation, central locking, radio/cassette player, split-fold rear seats, adjustable steering wheel, body coloured trim. Anti-lock brakes (ABS) and sports suspension were the main changes to the EB II XR8 sedan, which also benefited from the safety and rigidity upgrades the whole range received. The 165kW 5.0L V8 remained the same. A limited-run Falcon GT returned from November 1992, sporting around 195kW. New standard features: ABS, upgraded audio, clock, alarm (from early ’93). The evocative XR6 badge joined the sedan-only S club, which was basically an XR8 fitted with a Tickford-modified 4.0L I6 engine. Its power leaped to 161kW/365Nm, aided by a new exhaust and lower gear ratios. The XR6 did not replace the cheaper 148kW/348Nm 4.0L I6 S model until the ED series arrived in August ’93. The S returned late in the EL’s tenure. Standard features: ABS, LSD, power steering, alloy wheels, central locking, power front windows, power mirrors, upgraded audio, sports steering wheel, clock, front and rear spoiler and body coloured bumpers. Although the ED is remembered as Ford’s stopgap model to reign in the popular VR Commodore, it saw the debut of the XR series’ trademark twin headlight treatment, as well as the arrival of the XR6 wagon. Also unique to the XRs were a front spoiler, interior trim and the 161kW/365Nm Tickford-tuned 4.0L I6 or 165kW/388Nm 5.0L V8. A “Supersport” suspension option also became available. Meanwhile, Tickford breathed its high-performance magic on the XR8’s 5.0L V8, with a 192kW/405Nm power output being the outcome. New standard features: body coloured door handles, more carpet, map pockets. ED XR8 Sprint – After the 200kW 25th Anniversary EB GT of 1993, Ford decided to use the same engine (albeit detuned to 195kW) for a limited run XR8. The standard XR8 generated 165kW and was trounced by the lighter and nimbler XR6, but the Sprint clawed back some V8 kudos. The car was actually 70kg lighter than the GT, at 1579kg. As a result it Sprint-ed from 0-100km/h in 7.3 seconds, on the way to a 230km/h terminal velocity. Other goodies included a tasty Momo four-spoke tiller, 16-inch ROH rims, suspension revisions including 5mm lower springs, and new anti-roll bars for better high-speed stability. The fully revamped EF’s sleeker nose meant a well-integrated twin headlight nose characterised the smooth XR series. Over the ED, the EF also featured an all-new tail (sedan only) and interior design, with only the doors being carried over. Substantial engineering changes resulted in revised motors (the standard Tickford-tuned 4.0L I6 was now 164kW/366Nm or 170kW/398Nm 5.0L V8), suspension, steering, brakes, computer power and body crash resistance, while better seats and a driver’s airbag were introduced. And finally the old under-dash handbrake gave way to a console-sited one. New Standard features: driver’s airbag, centre console with armrests and drink holders, upgraded audio, passenger seat lumber support, service interval indicator, console handbrake. A front passenger airbag made the headlines, along with revised suspension tuning to tame the allegedly twitchy rear end. New trim, better front seats, increased crash protection, greater refinement and improved boot security are also EF II highlights. The XR6’s 164kW/366Nm 4.0L I6 and XR8’s 170kW/398Nm 5.0L V8 engines’ outputs remained the same as before. The wagon variant was discontinued. New standard features: leather steering wheel, new gold “4.0i” badge. An even smoother iteration of the XR series’ twin headlight treatment was grafted onto the EL’s nose, along with a redesigned bumper. A new colour and rear spoiler were added. Recalibrated suspension, ABS brakes and steering, and upgraded refinement levels were also introduced, while small trim changes were implemented inside and out. The 164kW/366Nm 4.0L XR6 engine was carried over, but there were two XR8 variants during the EL’s lifespan: a slightly upgraded 170kW/398kW 5.0L V8 until October 1997; and a 185kW/402Nm version from then onwards. New standard features: Air-con (XR8 only from Oct ’97), thicker tinted glass, passenger seat height adjuster, upgraded audio, mobile phone wiring, battery light saver. The curvy AU sported an all-new body and interior, heavily revised drivetrain, recalibrated coil spring suspension, optional independent rear suspension (IRS), extra standard features, greater refinement and much improved dynamics. The base XR6’s 164kW/366Nm 4.0L “Intech” I6 was completely overhauled, and considerably quieter and more efficient for it. A new XR6 model called VCT was released, featuring more efficient engine breathing and IRS. That produced 172kW/374Nm. Meanwhile, the XR8’s venerable 185kW/412Nm 5.0L V8 benefited from a small torque increase. Plus, IRS was a standard fitment. But in spite of such advances, the futuristic, oval styling divided opinions, as did the XR series’ droopy twin headlight and grille treatment. Falcon sales dovetailed. A desperate Ford attempted to resuscitate its faltering Falcon fortunes by making the rear appear less saggy – a squarer rear bumper and boot number plate valance helped, as did larger wheels and tyres. Inside there was classier cabin trim and extra standard features. Suspension and ride qualities were improved, and extra sound deadening brought on greater refinement. On the safety front, a passenger airbag and seatbelt pretensioners were made standard. Meanwhile, the XR8 gained a 200kW/420Nm version of the 5.0L V8 until May 2001, when the V8’s power output was raised again, to 220kW/435Nm. Service intervals were extended from 10,000km to 15,0000km, with free servicing for 60,000km. Still, Commodore sales kept bounding away from the Falcon. New standard features: dual front airbags, sports suspension, CD player, sunglasses holder, metallic-look trim, speed warning, remote control boot release, side skirts (from May 01). Engine options: 172kW 4.0L VCT I6, with standard IRS. 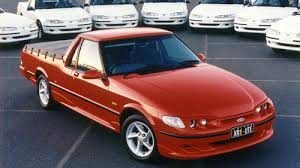 In 2001, TVE also built 125 units of the XR8 Rebel, which were characterised by a Ford Racing bodykit (instead of the standard Tickford version), 18″ alloy wheels and, more importantly, the 220 kW “Synergy 5000” 5.0-Litre V8 version of the “Windsor” engine from the FTE T series. Ford also provided a Sony PlayStation2 and a copy of Gran Turismo 3 signed by both Glenn Seton and Steven Richards as part of the package. Trainspotters should be aware of the “Series III” badge, smoked headlight surrounds, body coloured mirrors and trim, the addition of side skirts, clear side indicator lens and an extra-tinted windscreen. The 220kW Windsor 5.0L V8’s last stand was in the AU III XR8, replaced by all-new overhead cam versions in the BA series that followed. New standard features: 17-inch alloy wheels, new badges. 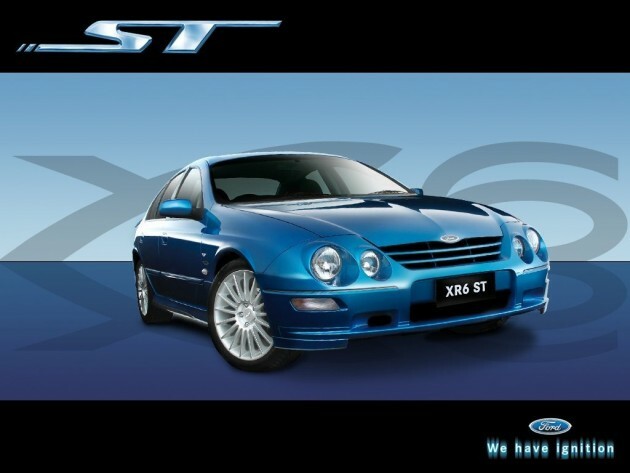 Ford showed a “Sprint” version of the AUIII XR6 VCT at the 2002 Melbourne Motor Show, with 18-inch Azzuro alloys, a Rebel body kit and Momo steering wheel. But the name was changed to ST when it launched. The most changed model in its 42-year local history, only the Falcon’s doors and some under-body bits were carried over from the unfortunate AU. From the flattened roof, squared-off nose and German Audi-style tail, to the all-new soft-feel interior that even featured altered seating and steering wheel position mounts, everything one could see and touch in the BA was modern yet conservative. But underneath a revolution took place. Three virtually all-new engines, complemented by a Tiptronic-style four-speed automatic or five-speed manual gearbox, were introduced: a 182kW/380Nm 4.0-litre OHC variable-valve timed inline six-cylinder engine; a turbocharged version cranking out 240kW/450Nm, and an American-sourced but Aussie-developed 260kW/500Nm 5.0-litre DOHC 24-valve V8 known as the Boss 260. All were significantly gutsier than their predecessors. “Control Blade” multi-link independent rear suspension (sedan only), an 80-per cent increase in torsional rigidity, completely new rack and pinion steering, improved safety and refinement properties, and far more computer power elevated the Falcon to a world-class standard in driving, comfort and ride terms. Only the portly weight and high fuel consumption remain problem areas. Sales skyrocketed and, after 36 years, the Falcon won its third <i>Wheels</i> Car of the Year award. The XR series BA proved to be more popular than even Ford had anticipated. All versions included dual front airbags, anti-lock brakes, keyless entry, power front windows, power steering, electric mirrors, a CD player, air-conditioning, 17-inch alloy wheels, a body kit, sports suspension, bolstered seats and a rear spoiler. But there was no wagon variant. To stem off the re-engineered Holden VZ Commodore and revised Toyota Camry, the BA MkII XR range was about a host of minor trim and specification alterations, including several new colours, redesigned alloy wheels and a suspension upgrade on the 260kW/500Nm XR8. The 240kW/450Nm Turbo and XR8 models were now fitted with a Tremec T56 six-speed manual gearbox, while the standard 182kW/380Nm XR6 remained as a five-speeder. Plus there were subtle modifications to the auto and suspension tune, with traction control made standard on both auto and manual. New standard features: cruise control, headlights-off device, rear power windows. With the BF Falcon facelift Ford extended the appeal of its BA Falcon with a range of under-the-skin improvements, but wrought very little in the way of visual appearance upgrades. The big news came in the form of a six-speed automatic gearbox option – the German-made ZF 6HP26 unit – in lower-grade Falcons, while it was made standard in more expensive versions like the Ghia and XR8. Ford also improved the existing 4.0-litre Barra in-line six-cylinder engine powertrain. Power increased from 182kW to 190kW at 5250rpm while torque now topped out from 380Nm to 383Nm at 2500. Detailed changes decreased the engine’s noise, vibration and harshness properties while increasing fuel economy. There were also modifications to the existing Ion four-speed automatic gearbox in the rear-wheel drive models, for extra smoothness and refinement. Other changes included an increase in output for the 4.0-litre Barra 245T – now with an extra 5kW and 30Nm (245kW at 5250rpm and 480Nm at 2000rpm) – while the 5.4-litre Barra 230 V8 now offered another 10kW and 30Nm to achieve a maximum 230kW at 5350rpm and 500Nm at 3500rpm. The 156kW Barra E-Gas engine also went up slightly in torque – from to 374Nm from 372Nm. There was also greater availability of the Tremec six-speed manual gearbox, along with minor trim and equipment alterations. FORD’S BFII facelift was designed to keep the ageing, 2002 BA Falcon-based series – itself a thorough redevelopment of the failed 1998 AU model – fresh in the face of the all-new Holden VE Commodore and Toyota Aurion assault. The big news is the standardisation of the ZF six-speed automatic gearbox across the XR range – XR6, XR6 Turbo and XR8. Strangely, Ford retained the BA-era XR snout for the BFII, while the rest of the range received the sleeker new nose. Visual tweaks include a new front bumper, while minor trim and equipment adjustments were implemented inside. Engine power and torque figures remain the same in the BFII XR. Ford’s also introduced improved transmission thermal management – faster warm-up and reduced friction losses that allow the six to reach optimum efficiency earlier, which Ford says, improves fuel consumption during cold starts and on short trips. In a further announcement, a limited edition “XR by Craig Lowndes” Falcon Ute special vehicle pack has been released, which is available on XR6, XR6 Turbo and XR8 Styleside Box models, including XR6 with the optional E-Gas dedicated LPG engine. XR by Craig Lowndes Utes offer almost $6,000 of additional equipment and features for just $1,000 over the recommended retail price of the standard XR Utes. Additional features include a set of four 18-inch sports alloy wheels, a one-piece hard tonneau cover with integrated power bulge and rear spoiler, Momo steering wheel, prestige audio system with six-disc in-dash CD player, an iPod®/MP3 audio player input connection and unique “by Craig Lowndes” decals. As part of the exclusivity of the XR by Craig Lowndes Utes, only a limited selection of exterior paint colours are available – Lightning Strike, Octane, Vixen, Conquer and Silhouette. The Momo steering wheel is available in Blue, Grey or Red depending on the exterior paint colour and interior seat trim colour of the vehicle. Only 650 examples of the limited edition XR by Craig Lowndes Ute were built. The XR6 Turbo came with a reworked engine that happened to deliver the same 270kW as the previous model, but with 533Nm of torque. 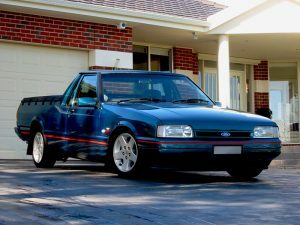 The big-bore turbo six was a masterstroke of Ford Australia engineering and, apart from offering a seamless surge of acceleration in both six-speed manual and even slicker six-speed automatic forms, the XR6T was also relatively frugal with an official fuel consumption average of 11.7L/100km. The FG-series XR8 (discontinued in April 2010 due to it not meeting the Euro 4 emissions standard) was the first to not be the quickest and most expensive sports variant of the Falcon model range, as well as the first to produce less peak torque than its six-cylinder XR6 Turbo sibling. The XR8’s performance and standard equipment list did’t match the SS Commodore’s, which ran to a 6.0-litre alloy V8 and side curtain airbags, but the Ford evened up with climate-control air-conditioning, while the V Series-rivalling XR8 Luxury Pack added 19-inch alloys leather trim and premium sound and climate systems. In April 2010 the FG range received an update, with the naturally-aspirated and turbocharged inline-six engines tuned to meet Euro 4 emissions standards, although there were no performance or cosmetic upgrades. Equipment and fuel efficiency gains followed the replacement of volume-selling models’ five-speed automatic transmission with Ford’s slick six-speed ZF auto. Side head/thorax airbags became standard in in XR6 and XR6 Turbo Ute models – but not in entry-level utes. Similarly, while head-protecting front side airbags were standard across the Falcon sedan range, curtain airbags to protect rear passengers remained optional at base level in the Falcon, unlike its locally-built large-car rivals. Bluetooth phone and iPod connectivity became standard on all FG Falcons (except utes with the optional column-shift), instead of being standard only on the G6E Turbo. 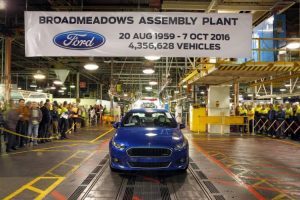 Ford’s final Falcon launched locally in late 2014, bringing with it an updated face and major overhauls. Touted as the most technologically advanced Falcon ever, Ford added its new Sync2 connectivity system housing an eight-inch touchscreen with climate, navigation, telephone and infotainment systems. Other systems added as standard include an Emergency Assistant system, front and rear parking sensors, a reversing camera and the Falcon also came with a five-star crash safety rating. 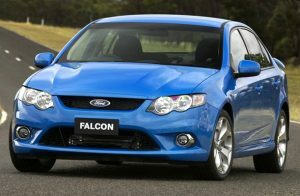 Engine choices for the Falcon include a 4.0-litre inline six-cylinder in the base Falcon, a 2.0-litre turbocharged four-cylinder in the EcoBoost and a range-topping 5.0-litre 335kw V8 in the XR8. 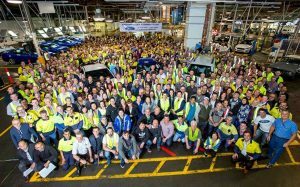 To mark the end of the Ford Falcon’s story – and the end of Ford manufacturing in Australia – the Blue Oval released the Sprint in March, 2016. Just 1400 were made – 850 XR8 and 550 XR6 – with New Zealand buyers scoring 100 of the former and 50 of the latter. Based on the XR6 Turbo’s 270kW/533Nm 3984cc 4.0-litre twin-cam unit, the XR6 Sprint gained a number of changes, including a higher compression ratio (to 8.7:1 from 8.5:1), a redesigned lower airbox, larger carbon fibre air intake, freer flowing exhaust, unique transmission calibration, bespoke engine calibration (including an engine-first launch control system, and GT F (V8) transmission mount (for improved handling characteristics. 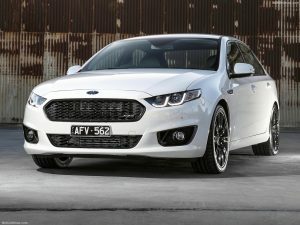 Ford engineers have also swapped in the turbo and injectors from the FPV F6 that was discontinued when the car-maker’s Australian performance arm was shut down in 2014. Power was rated at 325kW (overboost: 370kW) at 6000rpm and the torque top is 576Nm (overboost: 650Nm) at 2750rpm. It drives the rear wheels via a six-speed automatic, because the regular Turbo’s six-speed manual couldn’t handle all that torque. Under the bulging bonnet of the XR8 was an uprated version of the 5.0-litre Supercharged V8 producing 345kW at 5750rpm and 575Nm at 2220-6250rpm, an increase of 10kW/5Nm over the standard XR8. In lieu of a six-speed manual there was a six-speed automatic. Visual changes included different foglight surround with a cut-out vent in the bumper, Sprint badging on the rear and mudguards, a stripe decal on the side in signature hockey stick style to match the daytime running light design and Sprint scuff plates, while the indicator has moved to the exterior mirror. It also gained black headlight bezels, a black rear spoiler, body coloured deck-lid Appliqué, black 19-inch alloy wheels, six-piston front and four-piston rear Brembo brakes in gold and a numbered build plate for each model located on the engine. Inside, both variants feature a unique Sprint interior with special seat packaging of leather/Lux suede trim, an auto-dimming mirror, a unique gear shifter assembly and surround, Sprint label on manual shifter, a gauge cluster with Sprint logo and an ‘interior command centre’ with dual-zone climate control and a ‘high-series audio system on top of the Sync2 connectivity system. Besides the uprated engines, the Sprint featured firmer suspension in the XR6, softer suspension in the XR8, different dampers, springs, brakes, and steering tune, as well as unique Pirelli P-Zero high-performance tyres that were tuned to the suspension. The Sprint development program was led by a team of Falcon Product Development specialists that were part of the Asia Pacific Product Development outfit based in Victoria.